On 13 September, Access Partnership hosted a roundtable discussion on the role of High-Altitude Platform Stations (HAPS) and Remotely Piloted Aircraft Systems (RPAS) applications in telecom infrastructure. The event was led by our Director for Infrastructure, Colin Thomson, and attended by HAPS/RPAS developers and vendors, government and regulators, and industry experts from the legal, financial and insurance industries. Participants discussed the challenges, opportunities, regulatory landscape for companies operating with HAPS/RPAS, as well as implications for the insurance and financial industries. Recent efforts — such as the UK Space Agency’s Prosperity from Space strategy, the Space Growth Partnership between industry, academia, and government, and the Space Sector Deal — have established the UK as a leader in the space sector. However, while the UK Space Agency can help unlock private sector investment, government could do more to integrate HAPS/RAPS technologies into its programme and find other policy initiatives to boost investment. A key challenge here is the lack of clarity over the national and export market size for this technology. Participants suggested drafting a white paper with hard evidence for HAPS/RPAS use cases and demand in upstream and downstream industries. This would inform an argument stating the economic and social benefit to the UK and its citizens, which would strengthen both the business case and stakeholder buy-in. Training and technical skills were cited as key areas where government could boost HAPS investment and innovation. The UK has a permissive regulatory environment for piloting HAPS/RPAS, with the Civil Aviation Authority (CAA) typically adopting a pragmatic approach. Participants suggested developing a HAPS/RPAS training syllabus for consideration by the CAA and government stakeholders. The document would examine aircraft transit in controlled airspace, licence requirements for pilots (CPL, ATPL, PPL), the creation and development of a bespoke course, and designated take-off and landing sites to avoid populated areas and airspace. An additional topic of discussion was HAPS/RPAS access to spectrum at national and international levels. HAPS and RPAS require spectrum for command and control, which will vary depending on the operational environment, and often further payload spectrum to support mission requirements. The ITU designated the 6 GHz, 28-31 GHz and 47 GHz spectrum bands to HAPS, which are widely agreed to be manifestly inadequate and have limited technical and operational innovation. Accordingly, the World Radio Conference in 2019 (WRC-19) will consider designating further spectrum in the 21 GHz, 26 GHz, and 38 GHz bands for broadband applications. In the UK, innovation and trial licensing is already available, but this is limited to non-permanent and non-commercial uses. While these support research and development, there is no general licensing product for HAPS to provide commercial services on a permanent basis, either domestically and internationally. This does give the UK an opportunity to champion global harmonisation of HAPS frequencies. The participants committed to draft material on HAPS/RPAS licensing for consideration by government and Ofcom, to advance a clear licensing regime for HAPS and stimulate demand. As insurers are looking to diversify, HAPS/RPAS likely represent an attractive market. However, given the niche and nascent nature of the technology, insurance costs are more expensive than the technology itself, and the industry does not know how to effectively cover them. Nevertheless, the insurance brokers and underwriters in the roundtable remained positive that as the technology, applications, and services evolve, the market will develop insurance products more aligned with the cover and cost expectations. Engagement from the insurance market relies on understanding (i) the specific coverage needs of the sector; (ii) the technical risks posed by the systems’ manufacture and operation; (iii) the potential size of the sector as it develops and grows. The centralised London insurance market lends itself well to introductory and explanatory presentations with key market participants. Finally, the group considered the various funding opportunities available from government and private investors. UK Export Finance is keen to invest in HAPS/RPAS due to the high proportion of UK content required for building some HAPS/RPAS platforms and the real business case for their use. Investments avenues will vary depending on development; venture capitalists have a stronger appetite for higher risk and higher returns from start-ups, while conventional private equity or institutional investors are more focused on scale within established businesses. Ultimately, the investment community has little appetite for investing in businesses without a clear focus. The UK government has a range of funding mechanisms available for the development of the HAPS technology or the downstream services, depending on business size, timing, target market and product maturity. Innovate UK’s open competition will distribute £20 million for projects between £25 000 and £2 million, and its innovation loans competition will loan up to £1 million to SMEs. DCMS will fund 5G testbeds facilities and trails as part of its £1 billion investment in national digital infrastructure. Manufacturing facilities or innovation programmes can also be funded by local enterprise partnerships or EU mechanisms, such as H2020. There is certainty about the opportunity presented by HAPS/RPAS technology, applications, and services, but further work is necessary to quantify the size and make-up of financial opportunity. The UK can establish itself as a thought and market leader for HAPS/RPAS technologies and services. Immediate opportunities present themselves to develop a framework training syllabus for HAPS/RPAS operators, and a market access spectrum licensing product for HAPS/RPAS commercial services. Existing insurance products are prohibitively expensive for nascent HAPS/RPAS business and do not provide appropriate cover, however, the industry has the flexibility to develop more appropriate insurance products as the market evolves. 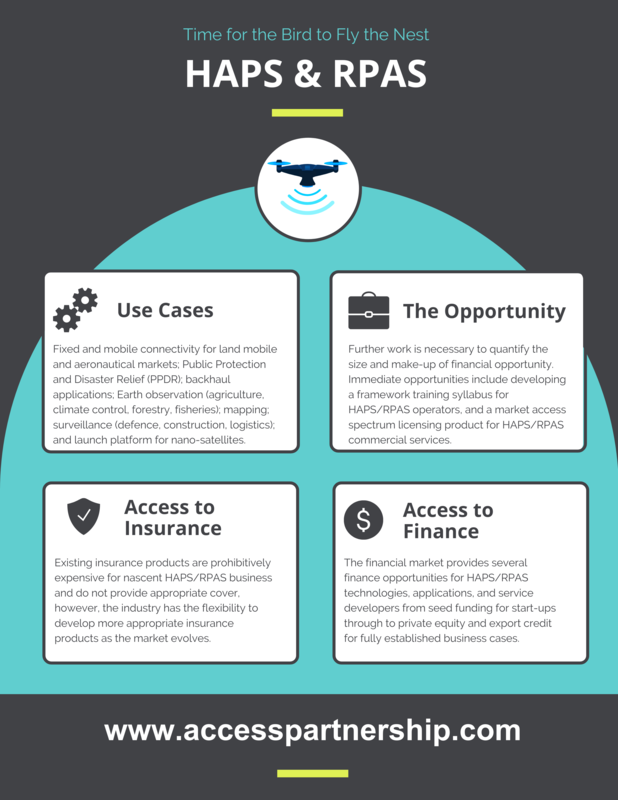 The financial market provides several finance opportunities for HAPS/RPAS technologies, applications, and service developers from seed funding for start-ups through to private equity and export credit for fully established business cases.